How about some John Fox? Probably the best known of the future Flashes. Future Flashes makes me think of the FFA, Future Flashes of America… Anyway, John’s biggest moment in the spotlight is when Wally was lost in the Speedforce and John took his place in the present. That and his creepy advances towards Linda. Between him and Argus, Linda was just plagued by superhero stalkers. I’m not painting a glowing picture of John am I? Truth be told he is pretty much a well meaning screw up. Since Zoom has been messing with Barry’s timeline, we can’t forget that Barry and Iris had twins…Tornado Twins. This is where time travel makes my head hurt. Before his death in Crisis Barry and Iris lived together in the future and Iris gave birth to Don and Dawn Allen. But sometime after their birth Iris comes back to the present to be with the resurrected Barry. So they now live with their present day friends and family and they just ignore their kids living in the future? We already know Barry’s past has been changed; will Flashpoint change his past in the future? 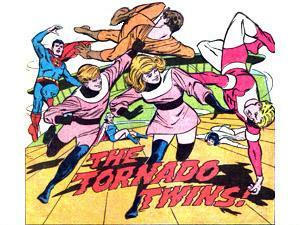 Since we’ve brought up the Tornado Twins, we have to talk about XS. Jenni Ognats is Dawn Allen’s daughter and Bart’s cousin. She is a member of the Legion and well, I’m not sticking my head in that continuity mess. Sorry all of you Interlac speakers, I am lost when it comes to Legion. 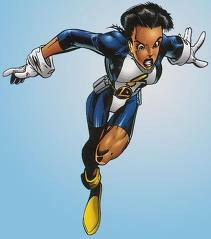 All I’ll say is she is an adorable character and I hope she makes an shows up in Flashpoint. I could be wrong but I don’t think she has really been seen much since the Legion of 3 Worlds mini. Those aren’t the only members of the future Allen clan either. Chain lighting introduced us to Sela, Blaine, Jace, and an army of unnamed descendants. I always liked Jace Allen, but I realize the chances of him making an appearance are slim and next to none. Of course now if started flirting with Jesse Quick he’d have to deal with her husband. He was just so damn dapper in his helmet. Even more unlikely to show then Jace Allen is my favorite Flash, Walter West. Now we aren’t even talking about time travel, we’re looking at Hypertime parallel earths. I’d say the only way he is going to show up in Flashpoint is if I get a marker and draw him on the page myself. That being said even Walter probably has a better chance of showing up then the Terrific Whatzit, the Crash, and Fastback do. Which is sad, because I bet Flashpoint could use some Turtle Power. Walter's story was kind of convoluted but man his costume was awesome. 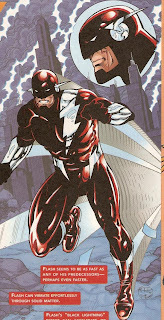 I was kind of hoping that Wally's new costume would be similar to Walter's... maybe by the end of Flashpoint Wally will have a new costume that will more closely resemble Walter's. 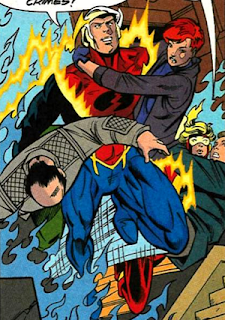 Oh and I hope they un-do Owen Mercer's death as being Bart's half-brother he is also part of the Flash family. Think of the interesting family dynamics half-brother is Kid Flash but dear old dad is Captain Boomerang. Owen's death was so pointless. And the tease about his dad in the future has been going on for so long I wonder if we'll ever see how it happened. 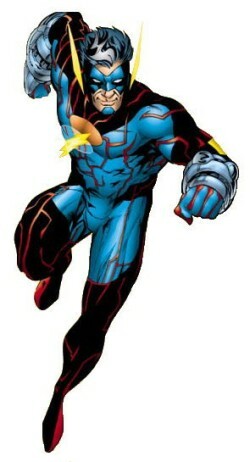 Walter showing up as the only 'Wally' West in the entire Flashpoint story would rock that whole storyline! Hypertime/Hyper-realities aside I hope that isn't the only way we get our Wally fix throughout Flashpoint. I agree Walter's costume did rock! I too was hoping for something similar to that but I am just as happy that they gave him a look close to the Justice League Animated design. Wally's new cowl looks pretty similar to Walter's. I think changing his lightning design to the cartoon's was a pretty genius move.